The face of superhero culture may be gone with the passing of Marvel legend Stan Lee, but there is no risk of his work fading into the pop culture background. Instead, the indelible characters he created such as Spider-Man, The Hulk or the X-Men are essentially modern mythological heroes, whose place on the big screen is immutable. "Graphically and culturally, these characters have influenced fashion, street art, pop art, design, television and cinema: Their importance is significant," said Jean-Jacques Launier, the founder of the Art Ludique museum in Paris. The museum - dedicated to the "art of entertainment," according to its website - staged an exhibit on Marvel superheroes in 2014 and then a similar one for DC Comics last year. Superheroes first entered the wider public consciousness in 1938 with the arrival of Superman in Action Comics #1. The following year, he was joined by the Caped Crusader, Batman. 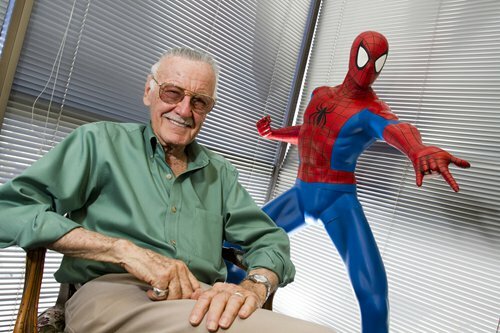 The genre lost popularity in the post-war period but rebounded in the late 1950s and early 1960s - notably thanks to Lee, who created The Fantastic Four in 1961 for Marvel Comics. In quick succession, The Hulk, Thor, Spider-Man, the X-Men and Black Panther followed. Today, those characters have become ubiquitous in pop culture - regulars on the world's movie screens, stars of video games, the most-wanted toys on children's Christmas lists. After a series of animated specials and early films, superheroes returned to the silver screen with a vengeance in the 2000s. In 2008, Marvel launched its linked Cinematic Universe with Iron Man. The following year, the company was acquired by Disney. Twenty films have come out in a decade, with three more already scheduled for release. DC Comics, which belongs to Warner Bros, is now expanding its own cinematic Justice League universe - starring Superman, Batman, Wonder Woman and Aquaman. Today, it seems like hardly a month goes by without a hero's name on the multiplex marquee. "Superheroes are a sure thing in terms of Hollywood blockbusters," says Jessica Assayag, who runs programing at Comic Con Paris, the French edition of the mega pop culture festival based in San Diego. "The world of superheroes has allowed major studios to keep planning ever more ambitious films that audiences love." There is a winning formula: emphasize the very human problems and conflicts of those gifted with superpowers, which allows the public to identify with them. "Marvel's superheroes, and those who have since been inspired by them, sort of represent the old phrase 'Money can't buy you happiness,'" according to Xavier Fournier, an expert on the genre. "It's moving to see a guy with Spider-Man's powers but who, when he removes his mask, can't pay his rent and worries about his elderly, sick aunt." Another reason for superhero staying power? Their ability to adapt to the times. When Lee first created his emblematic heroes, "the Cold War was raging, and fear of nuclear bombs along with it. Spider-Man gets bitten by a radioactive spider, The Hulk is exposed to gamma rays, the X-Men are called the 'children of the atom,'" explains Launier. Avengers: Infinity War, which came out earlier this year, is currently ranked No.4 on the all-time worldwide box-office champions list. One of its main themes? Overpopulation. Black Panther, the most successful movie ever with a primarily non-white cast, looked at issues of heritage and nationality, noted Launier. For comics expert Jean Depelley, "comic books have always known how to evolve with the times and take on the issues of the day." "There were comics that talked about Watergate, the Vietnam war. Today, comics touch on racism and transgender issues," he told AFP. For Assayag, superhero films are here to stay for a long while, especially because their protagonists are household names. "As long as the creativity and inventiveness are there, they will not run out of steam," she said.